Neck pain is a common complaint from office workers who spend a long time sitting in front of the computer. Similarly to other pains associated with poor ergonomics, ergonomic neck pain can be attributed to a poor workstation design and repetitive tasks. The main cause of neck pain in the office worker is bad posture. More specifically, it is bad posture caused by poor workstation design. 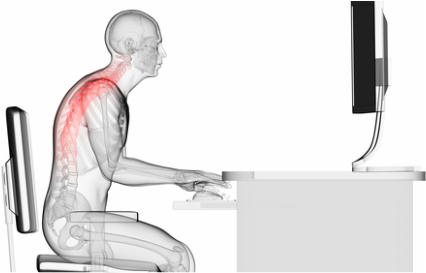 With this in mind, the easiest way to help prevent neck pain is to ensure your workstation is set up ergonomically. To understand the impact poor ergonomics has on neck posture, it is necessary to consider what happens to the neck when you sit with bad posture. Poking chin posture - notice how the chin pokes forwards. It compresses the back of the cervical vertebrae. This is the area where your nerve roots leave the spinal canal and travel down your arms. As such, a poking chin posture has the potential to compress cervical nerves. It places increased stress on the muscles that run from your shoulder blades to your skull. These muscles attach to the sides of your cervical vertebrae. By increasing the stress on these muscles, pain usually follows as a defence mechanism. Another issue that affects many office workers is cervico-genic headache. Cervico-genic headaches are headaches that originate from the neck region, and are felt in the head as a headache. As such, cervico-genic headaches are the result of referred pain. Cervico-genic headaches are very often accompanied by neck pain, because they originate from the neck. The relevance to poking chin posture is that as mentioned above, a poking chin posture compresses the cervical spine and stresses the muscles that attach to the cervical spine. These issues often cause pain, which is often referred to the head and felt as a cervico-genic headache. What to do about ergonomic neck injuries? The best way to help prevent ergonomic neck injuries, poking chin posture, or cervico-genic headaches, is to ensure your workstation is set up ergonomically. Of particular importance is that your chair and computer screen height are set up to help facilitate you to sit back into the backrest of your chair, to help stop you leaning forwards and subsequently stop you poking your chin forwards.